Artificial Intelligence (abbreviated as A.I.) has been the stuff of science fiction. The idea of a sentient robot that can think, create, feel, and express has inspired many to dream of the possibilities, sparking the imagination in practical theories and fictional storytelling of the triumphs and dangers in creating of a self aware robot. In the world of film, the idea is no different as dozens of filmmakers have descended upon the ramifications of creating such beings including movies like 2001’s Artificial Intelligence (or better known as A.I. ), 2004’s I, Robot, and even recently with 2015 ‘s Chappie amongst others. 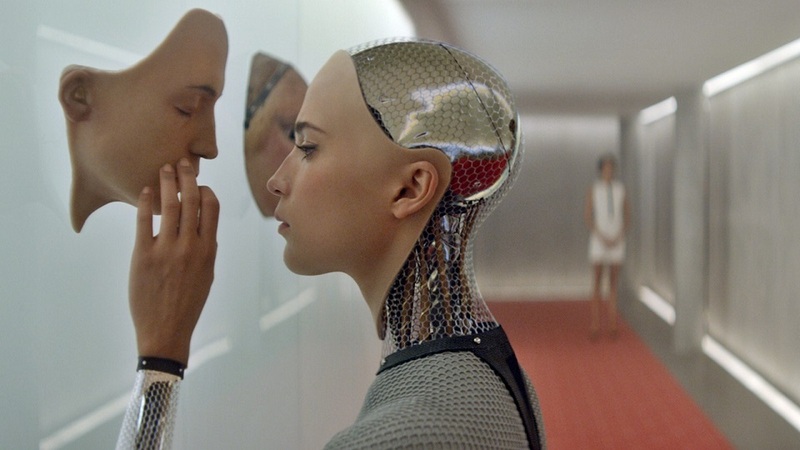 First time director Alex Garland shares his A.I. story with viewers in his directorial debut film titled Ex Machina. Does this film express a new understanding of artificial intelligences or is it too mechanical stiff in its undertaking? 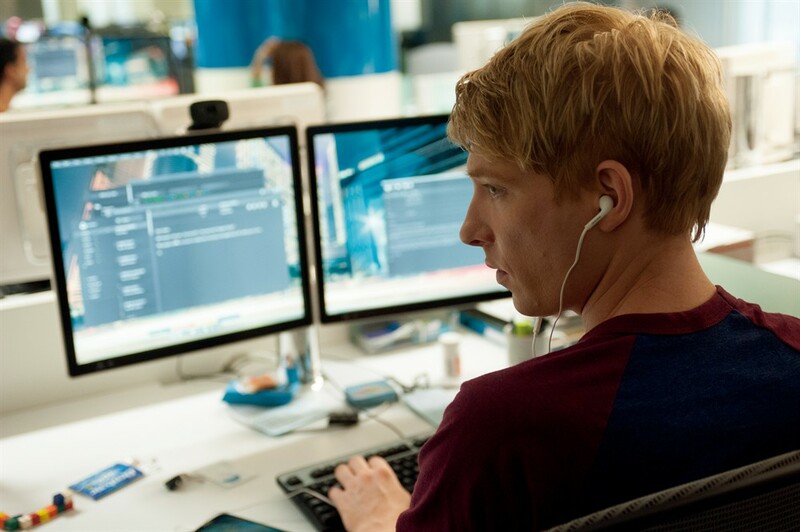 Caleb (Domhall Gleeson), a computer programmer at one of the world’s largest search engine companies, has won a company contests. Whisked off on a helicopter to remote location in the wilderness, Caleb is dropped off at a secluded research facility to spend the week with Nathan (Oscar Isssac), a tech genius and CEO of Caleb’s company. Nathan, who has little patience for frivolous talk of business politeness, asks Caleb to participate in unique scientific experiment, one that demands totally secrecy to the outside world, but, if successful, will bear universal acclaim. From an “outsiders” perspective, Caleb oversees a “Turing test” for Nathan, sending the young programmer to meet with Ava (Alicia Vikander), a sentient and advanced A.I. female robot, for analysis. Bonding through sessions of personal history and questions of life and awareness, Caleb begins to grow a curious fondness for Ava as does the robot herself with Caleb. However, being met with questionable motives and uneasiness from Nathan, Caleb sets out to learn more about Nathan’s endgame with Ava and uncovers the shocking secrets that lay within the isolated research compound. I remembered hearing some buzz about this movie sometime ago, reading that it premiered about some film festival. I kind just blew it off as just as indie (independent) film that was only going to be released in select theaters and nowhere near where I lived. A couple of weeks later, I remember seeing the trailer for it and that somewhat rekindled my interest. After finally viewing Ex Machina, my impression for the film is great with a captivating vice hold grip of a narrative and three terrific performances. One of the most remarkable things about Ex Machina is how well crafted the film is presented. Alex Garland, who first started out as a novelist writer, soon found his attention towards Hollywood where he became a screenwriter, developing screenplays for such films as 28 Days Later, 28 Weeks Later, Sunshine, and Never Let Me Go. Ex Machina marks Garland’s directorial debut what a amazing job he does. It’s truly an impressive feat as Garland captures the sense / experience of a seasoned director of a film that carries a complex subject matter of power, manipulation, and theological understanding. Credit should also be given to Garland’s creative filmmaking team like production designer Mark Digby for Ex Machina’s interior scenes, crafting a futuristic style in Nathan’s compound that conveys a touch of modernism and cold isolation. Director of Photography Rob Hardy must also be noted for elegantly bring the setting to life and also sweeping exterior shots of nature (from locations across Norway) that seems like something out of the popular documentary Planet Earth. Geoff Barrow and Ben Salisbury create a score for Ex Machina is also great, projecting the right musical tones for the feature, whether light, dramatic, or uneasiness. Even the visuals behind creating Ava’s robotic body are fascinating to behold. Kudos for all this being down on film budget that’s roughly only sixteen million dollars. Like most films that tackle the issue of creating artificial intelligence, paramount philosophical questions are always the underlining theme in the movie’s narrative. The discussion of nature vs. nurture, human consciousness, and the lingering dangers of playing god are examined in Ex Machina, while also being presented in very smart and sophisticated way that feels both enlightening and entertaining at the same time. Ex Machina is a slow burner, delicately unfolding its story of mystery, secrets, and revelations to its viewers. It’s a gratifying effort as the film builds to an outstanding ending that’s worthy of emulating a Stanley Kubrick film. Getting to that point, however, may draw some ire from some viewers, who crave more action oriented scenes. If so, Ex Machina might not be to your liking with better interest more suited for robust action sci-fi films that deal with A.I’s such as Blomkamp’s Chappie or (to a lesser extent and waiting a week or two) to see Avengers: Age of Ultron in theaters. Ex Machina doesn’t have a plethora of cast member to fill the screen time with, but rather focuses on three primary characters (all of whom do exemplary performances). Acting in such films as Inside Llewyn Davis, A Most Violent Year, and Star Wars: The Force Awakens (to be released later this year), actor Oscar Isaac does a commanding job in his role of Nathan. Isaac brings a level of complexity to the characters with an underling mad scientist tone as Ava’s creator, but also, and more surprisingly, in his humor, which adds some lighter moments to a tale that has a lot gravitas to it. British actor Domhall Gleeson, who many will recognize from Harry Potter’s films (Deathly Hallows Part 1 and 2), last year’s Unbroken, and also starring opposite Oscar Isaac in Star Wars: The Force Awakens, plays his character Caleb with a mixture of innocence, intellect, and overall mortal center as he interactive with Ava and Nathan. Speaking of Ava, she’s amazing or rather Alicia Vikander is. The Swedish born actress is incredible on-screen, offering a role that seems otherworldly in her performance as an artificial creation. Whether from her subtle facial expressions, her stiff movement, or her curiosity with her sessions with Caleb, Vikander’s act is hauntingly beautiful. Alex Garland’s Ex Machina is to be hailed as a crowning achievement for a directorial debut. This sci-fi feature is equally measure thrilling, alluring, and constantly thought-provoking in every way possible. To me, it was excellent film that asks big ideas with a balance of sophistication and entertainment. Paraphrasing some of my words from my review of Blomkamp’s Chappie, whether you believe the film as cautionary tale of humanity’s future in dealing with artificial intelligences or the just the pure imagination of science fiction, Ex Machina is masterfully and thematically done right, opening up discussions of poignant values and consequential faults, while also being a very satisfying sci-fi thriller for movie lovers. I am not really whether Garland wrote 28 Weeks Later though. On imdb he is not listed as a writer, amd wiki says we was an exec. producer. Whatever! I love this guys. His next movie is coming out soon. Also sci-fi.